Ned can identify a broken incisor tooth, a retained deciduous canine, a missing premolar tooth, tartar, gingivitis and exposed tooth roots on this canine dental model. Can you? Ask Dr. Iain- Dental Care for the Griffon. Is there anything different about Griffons? In common with most other Toy Breeds our Griffons do have some differences in their dental care compared with larger breeds. Larger dogs generally can keep their teeth clean and healthy by eating plenty of big raw bones, just like those dogs and big cats in the wild do! However, little dogs often aren’t capable of crunching up those larger raw bones without the risk of breaking their teeth so alternative care might be required. Some small dogs do well with smaller raw bones like chicken necks or a vertebrae or two of a lamb neck or a piece of brisket bone given say two or three times a week, but some don’t or won’t! If you are offering bones then make sure they are always raw and never cooked. Dogs evolved eating raw bones and if they are able to crunch up the bone with the dental equipment they have, then they are usually quite capable of digesting it. Dogs weren’t sophisticated enough to cook their food! When we cook bones for them we are softening the bones so that they often eat more bone than they actually should but we are also changing the nature of the bone so that it is more difficult for their digestive enzymes to break the bone down. This is a good source of income for vets who are doing enemas under general anaesthetic on dogs constipated due to a mass of undigested bony faeces! Generally vets will recommend making the ‘lion’s share’ of a dog’s diet to be a balanced dry food. 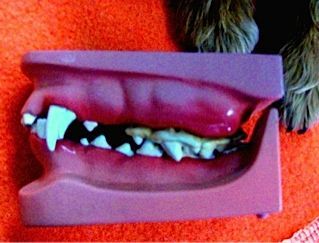 There are dry foods where the shape of the kibble actually encourages the cleaning of plaque and even tartar from the teeth as they chew it; examples include Hills oral care or Hills t/d (small bites) for small adult dogs. These special dental diets may be required if in spite of offering mainly dry food and dental treats a dog is developing periodontal disease. Otherwise, giving any appropriately balanced dry food every day with a little wet food and some smaller raw bones a couple of times a week will be adequate for most smaller dogs. Dental chews whether rawhide treats, ‘Dentabone’ or small ‘Kong’ type dental toys should also be offered, especially for puppies. Judges and Show Ring Griffons! 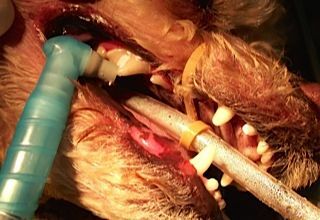 Griffon exhibitors in Victoria can be reassured that Trainee Judges are being properly educated about how to examine the teeth and bite of our breed. Griffons are meant to have a slightly undershot bite, where the upper incisor teeth (those small teeth that occupy the space between the two long canine teeth) are meant to sit a little behind the lower incisor teeth when the jaw is closed. Judges are meant to examine the bite of all dogs but the problem with examining brachycephalic breeds in the conventional way of lifting both upper lips at the same timewill mean that their nasal openings can be occluded and the dog can panic and resist! I can remember vividly the Griffons being judged by a European FCI judge at a Queensland Royal Show who insisted on examining their teeth like he did for other breeds which did lead to some dogs panicking and doing backflips on the table which he then excused from the ring. It wasn’t the Griffons who should have been excused! Fortunately our Victorian judges are being correctly trained that Griffons, like Pugs, Pekingese, Affenpinschers and Japanese Chins, need to have their bites either felt or if looked at, are done so by briefly lifting one upper lip at a time to glance at the bite and see that it is correctly undershot or alternatively pull the lower lip down (but never by grasping and pulling on the beard!). with the ultrasonic scaler! paste that has been applied to the tooth. Everyday we brush our teeth to remove bacteria which otherwise will form plaque, that soft white smelly material which we can collect on our fingernails when scrape our un-brushed and un-flossed teeth! Dogs get plaque just like us and over time, this dental plaque will become mineralized and form tartar, that brown smelly concrete material covering the tooth enamel. Tartar is not good! It is a source of infection that will creep up under the gums causing gum inflammation and infection (gingivitis). You’ll see this where the gums have that red coloration where they meet the teeth. If left untreated the infection (periodontitis) will creep up towards the tooth roots where it will cause loosening of the teeth and in a worst case scenario, can enter the blood stream and create infections elsewhere in the body like the heart valves. 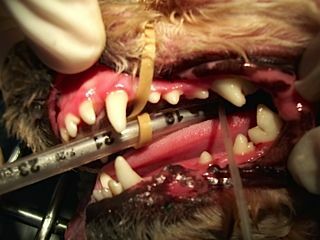 Dogs rarely get tooth cavities like we do; instead they seem to get gingivitis, periodontitis and eventually loosening and loss of teeth. Sometimes they can get tooth root abscesses, which usually affect the triple rooted upper 4th premolar (the carnassial tooth). These abscesses usually see the dog presenting with a hard swelling just below their eye. We normally remove this tooth and dispense antibiotics to resolve the abscess but a veterinary dental specialist can do a root canal treatment to try and save the tooth. If a dog has significant periodontitis then we usually will start some antibiotics and recommend a general anaesthetic under which we will scale all the tartar from the teeth using a water cooled ultrasonic scaler which loosens and removes tartar by it’s high frequency vibrations and then we remove any remaining plaque by polishing the teeth with a high speed prophy cup and paste (we use a bubble gum flavor paste in our practice) to leave a smooth polished surface on the teeth that will resist bacterial deposits for a time. Any loose teeth will be removed. 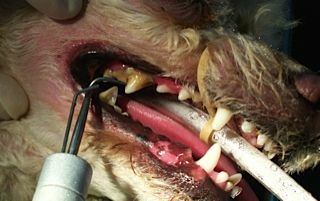 You always have the option of referral to a veterinary dental specialist especially if you wish to save any significant diseased teeth from being removed. Dental specialists can do root canal treatments (endodontics) and so avoid extraction of important teeth like the canines and carnassial teeth, do restorations of broken teeth, orthodontic treatment for those dogs with malocclusions and even replace a lost tooth with an artificial tooth! Dental completed! This dog had a scissor bite and is not a Griffon! Following a dental procedure or for those dogs with less severe periodontitis, we will recommend additional measures to try and keep the teeth clean and minimise the need for a future ‘dental’. We might recommend a dental friendly diet that have already been mentioned, but sometimes they may not always be appropriate either because the dog may be missing the very teeth that benefit the most from crunching on these foods or has another health condition such as diabetes, a propensity to bladder stones or pancreatitis or a food allergy which means that another diet is required. We might suggest using a product that can be added to the dog’s drinking water such as ‘Healthymouth’, which will resist formation of plaque. 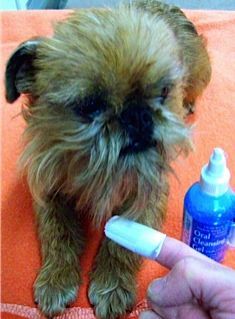 Other options include daily application of antiseptic dental gels such as ‘Maxiguard’ to the gums and brushing the dog’s teeth regularly. Can I share my tooth paste and tooth brush with my dog? The short answer is NO!! People toothpastes usually contain fluoride, which is a wonderful product so long as you spit most of the paste out after brushing. Unfortunately dogs aren’t terrific at spitting and will swallow more paste than we do and fluoride can be toxic if swallowed excessively! Normally I’d recommend daily application of a dental gel such as ‘Maxiguard’ and to follow this with a ‘brushing’ say two or three times weekly. Alternatively you might brush with ‘pet’ toothpaste a few times weekly. The best tooth brushes are pet ‘finger brushes’ that fit over your index finger and you simply massage in a circular fashion over your dogs teeth and gums. Don’t try and massage the inner (lingual) aspect of your dog’s teeth as it is impossible to do but is also unnecessary because most plaque and tartar actually forms on the outer (buccal) surface of their teeth. If you find using a ‘finger brush’ difficult then use a soft child’s toothbrush or pet tooth brush. If brushing proves impossible then products like ‘Healthymouth’ that are added to the drinking water can work quite well. Ned modelling with a finger brush and 'Maxiguard'. Just like us, dogs have a set of temporary (deciduous) teeth, which are usually lost as the adult teeth erupt from the gums. A common problem is where these teeth aren’t properly pushed out by the adult teeth but remain and can both trap food debris and hair or cause a malocclusion by interfering with the correct alignment of the emerging adult tooth. Retained deciduous canine teeth are the most common culprit! Typically vets can remove retained deciduous teeth at routine procedures like neutering for pet puppies, otherwise a show/breeding dog or puppy whose neutering is delayed should have a quick general anaesthetic and get these teeth removed by about 6 months of age. It’s important to provide pups with dental chews to encourage the removal of loose deciduous teeth. Dr Iain Mitchell BVSc(Hons), MACVSc.